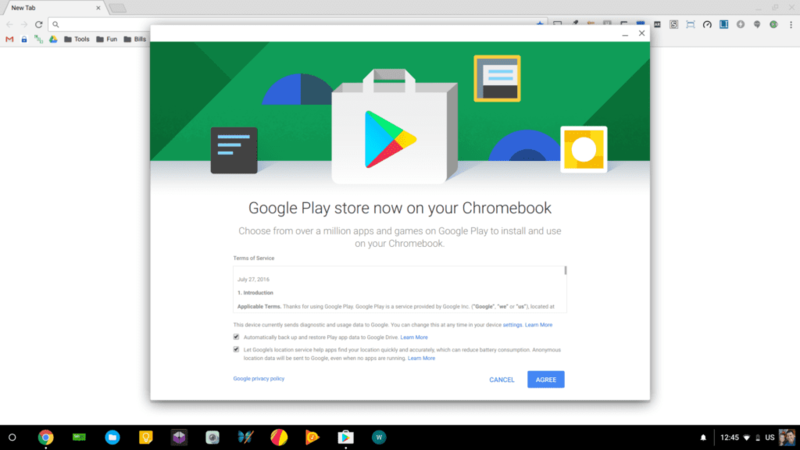 It looks like the Chrome OS developers are sneaking updates for the Play Store into more Chromebooks. Likely added in the latest Beta Channel update, we are seeing multiple devices with Android App support in Beta via a quick little method that works easily. We’ve covered the entire method before, but we’ll do it again for those of you who want to see it fresh. If you are seeing that, the method we are about to outline should work on your device, so regardless of whether or not it is on the list of confirmed devices, give it a try. It seems that once this shows in settings, the necessary parts for the Play Store are in place and just waiting to be activated. At this point, there are 4 models we have confirmed with this latest update. It stands to reason that many, many other Chromebooks have this update as well, but until we can confirm them, we want to stick to what we are sure of. Transition to Beta Channel (Settings > About Chrome OS > More Info > Change Channel > Beta) – a reset will occur and your local storage will be cleared. After this is done, close the crosh tab and log out and back in to reset the UI (don’t reset or power down). You should see the Play Store option in your settings now. If/when you actually fully power down your Chromebook, you will have to re-enter the command line stuff above to enable Android Apps again. As I’ve said above, we’ve confirmed this working for 4 Chromebooks, but there are likely a ton of others this will work on. If you give it a spin on another device and get it to work, let us know in the comments. It’s starting to feel like Android apps in Stable aren’t too far away!